Acting Profession - Welcome to Our Generation USA! Covers the Acting Profession for Television, Stage and/or Movies, including Award Ceremonies. For topics about actors only, go to "Actors". For topics about actresses only, go to "Actresses". ​YouTube Video from the Movie "Living Dangerously"
Pictured: Linda Hunt playing a boy in "Living Dangerously" and as she appears today. Cross-gender acting refers to an actor or actress portraying a character of the opposite gender. It is distinct from roles where transgender characters or characters who cross-dress are played. Click here for more about cross-gender acting. 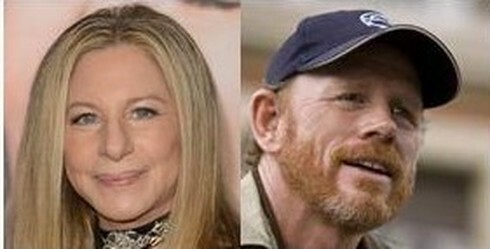 ​Pictured: Mickey Rooney & Elizabeth Taylor from National Velvet, and Andy Griffith & Ron Howard from the Andy Griffith Show. 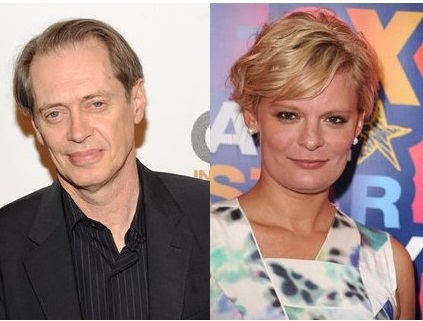 This is a list of former child actors from the United States. These notable actors were age 17 or younger at the time that they started acting, but are currently are 18 years or over. The list also includes child actors now deceased. List of People who have won an Oscar, Emmy, Grammy and/or Tony Award. YouTube Video of Whoopi Goldberg winning best supporting actress for "Ghost"
​Pictured: Audrey Hepburn and Mel Brooks. Twelve people have won all four major annual American entertainment awards in a competitive individual (non-group) category: the Emmy Grammy Oscar and Tony. This is a list of show business families. It is contemporary (in the sense that a professional offshoot should still be working in the 20th or 21st-centuries) and should be expanded. The guideline is that at least one of the relationships in the clan should be by blood – siblings parents children cousins and so on. Following families are brothers and sisters who are recognizable as celebrity siblings (and who may be listed within families as well). YouTube of Sandra Bullock adrift in Space in the 2013 movie "Gravity"
​Salaries for the world's highest paid film actors currently range from $20–30 million, but an actor can earn substantially more by deferring all or part of their salary against a percentage of the film's gross, known within the industry as a "profit participation" deal. Since not all salaries are made public, this is a non-definitive list of actors who have received $30 million or more as compensation for their services. The figures are given at their nominal value, since earnings from profit based deals are accumulated over many years, making it unfeasible to adjust for inflation. Click here for more about the List of the World's Highest Paid Film Actors/Actresses. 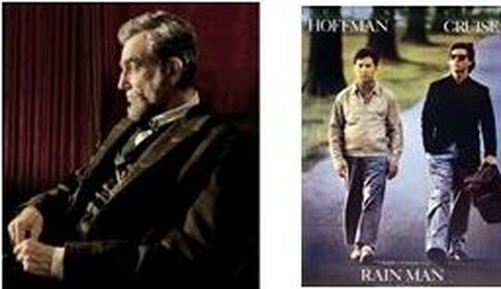 YouTube Video of Dustin Hoffman in "The Rain Man"
​Pictured: (Pictured: Daniel Day-Lewis in "Lincoln" & Dustin Hoffman Starring (along with Tom Cruise) in "The Rain Man"
​The Golden Globe Award is an American accolade bestowed by the 93 members of the Hollywood Foreign Press Association (HFPA) recognizing excellence in film and television, both domestic and foreign. The annual formal ceremony and dinner at which the awards are presented is a major part of the film industry's awards season, which culminates each year with the Academy Awards. Click here for more about the Golden Globe Awards. Peoples Choice Award for Actors and Actresses in TV or Films. 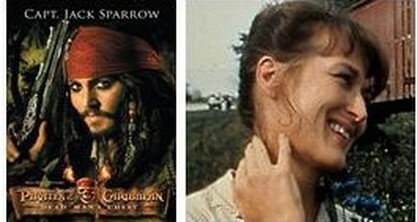 ​YouTube Video of Johnny Depp performing in the "Pirates of the Caribbean"
​Pictured: Johnny Depp in "Pirates of the Caribbean" & Meryl Streep in "The Bridges of Madison County"
The show has been held annually since 1975. The People's Choice Awards is broadcast on CBS and is produced by Procter & Gamble and Survivor producer, Mark Burnett. The first awards recognized "The Sting" (1973) as Favorite Picture of 1974, Barbra Streisand as the year's Favorite Film Actress, and John Wayne as its Favorite Film Actor. Ratings for the annual event peaked in 1977, when the third People's Choice Awards attracted 35.3 million viewers who witnessed Farrah Fawcett win the award for Favorite Female TV Star, "Star Wars" (the original 1977 Movie) win as the Favorite Picture, and Streisand and Wayne win again in the Film Actress and Actor categories. Click here for more about the People's Choice Awards. The Western is a genre of various arts, such as comics, fiction, film, games, radio, and television which tell stories set primarily in the later half of the 19th century in the American Old West, often centering on the life of a nomadic cowboy or gunfighter. Westerns often stress the harshness of the wilderness and frequently set the action in an arid, desolate landscape of deserts and mountains. Specific settings include ranches, small frontier towns and saloons of the Wild West. Characters also include Native Americans, bandits, lawmen, outlaws and soldiers. Some are set in the American colonial era. 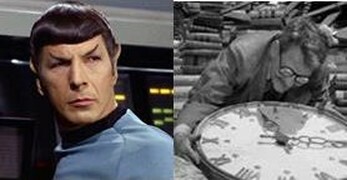 Pictured: Leonard Nimoy as Mr. Spock in the "Star Trek" Television Series and Burgess Meredith in the TV Twilight Zone Episode "Time at Last". Science Fiction TV Series are listed in Order of Popularity. 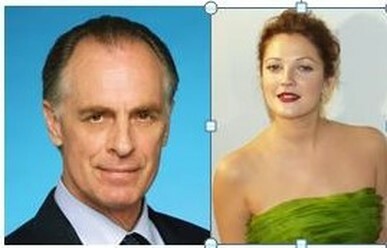 Click here for more about Stars Appearing in Two of the Highest-rated Science Fiction TV Series. The Actors Studio is a membership organization for professional actors theatre directors and playwrights at 432 West 44th Street in the Hell's Kitchen neighborhood of Manhattan in New York City. It was founded October 5 1947 by Elia Kazan, Cheryl Crawford, Robert Lewis, and Anna Sokolow who provided training for actors who were members. Lee Strasberg joined later and took the helm in 1951 until his death on February 17 1982. It is currently run by Al Pacino, Ellen Burstyn, and Harvey Keitel. The Studio is best known for its work refining and teaching method acting. The approach was originally developed by the Group Theatre in the 1930s based on the innovations of Constantin Stanislavski. While at the Studio actors work together to develop their skills in a private environment where they can take risks as performers without the pressure of commercial roles. Click here for more about Actor's Studio. 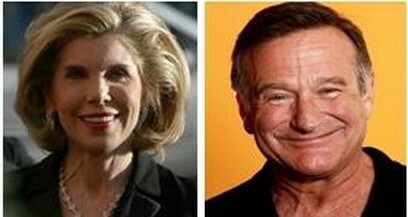 Pictured: Christine Baranski & Robin Williams, both graduates of Julliard. A drama school or theater school is an undergraduate and/or graduate school or department at a college or university; or a free-standing institution (such as the Drama section at the Juilliard School); which specializes in the pre-professional training in drama and theatre arts, such as acting, design and technical theatre, arts administration, and related subjects. If the drama school is part of a degree-granting institution, undergraduates typically take a Bachelor of Arts, Bachelor of Fine Arts, or, occasionally, Bachelor of Science or Bachelor of Design. Graduate students may take a Master of Arts, Master of Science, Master of Fine Arts, Doctor of Arts, Doctor of Fine Arts, or Doctor of Philosophy degree. Click here for more about Drama School. Method acting refers to a range of training and rehearsal techniques that seek to encourage sincere and emotionally expressive performances, as formulated by a number of different practitioners, principally in the United States, where it is among the most popular—and controversial—approaches to acting. These techniques built on the 'system' of the Russian actor and director Konstantin Stanislavski. and Sanford Meisner (the behavioral aspects). The approach was first developed when they worked together at the Group Theatre in New York. All three subsequently claimed to be the rightful heirs of Stanislavski's approach. His three major books were An Actor Prepares, Building a Character, and Creating a Role. Click here for more about Method Acting. ​Pictured: Football Star James Brown and Wrestler Dwayne "The Rock" Johnson. These and other sport stars went on to launch acting careers: click on right arrow in slideshow for each athlete-turned-actor. Click here for more about Sports Stars Who Became Actors. The greatest TV actors and actresses of all time. Some of these actors have been in movies, some of them are even more well known at this point for their work in films rather than on TV but all of these actors have really shown off some impressive chops on the small screen. From Bryan Cranston to Hugh Laurie and beyond, these are the best TV actors ever. From Emmy winners to simply fan favorites. Click here for more about the Greatest TV Actors and Actresses of all Time. From Biography.com: After years of on-screen success, many talented actors decide to take their chances on the other side of the camera—often to even greater acclaim. 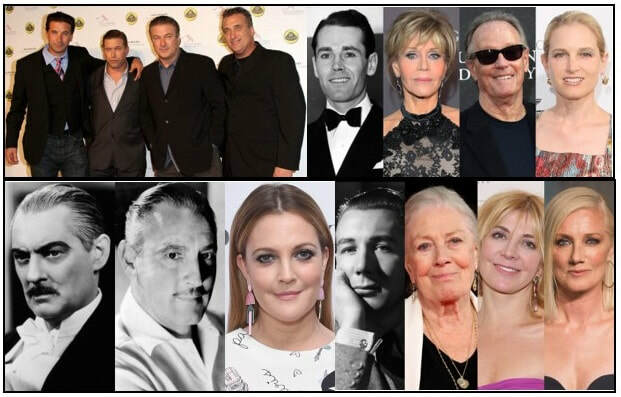 Click here to see Biography.com's collection of performers who have made a new name for themselves as film and television directors. Click here for more about Actors who have turned Directors. ​Pictured: Harrison Ford (Photo by Theo Wargo) and Jennifer Lawrence (Photo by Pamela Littky). These celebrities have acted/notable role in more than one successful movie franchise, and include Sylvester Stallone, Arnold Swarzenneger, Harrison Ford, and Angelina Jolie. 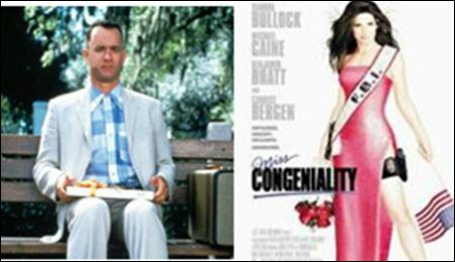 Click here for The Best Multiple Franchise actor/actress in history. YouTube from "Silence of the Lambs"* (1991) as "Buffalo Bill Dance Goodbye Horses"
​Pictured: The great white shark about to devour "Quint" (Robert Shaw) in "Jaws" (1975). Sean Connery and his prized Aston Martin in "Goldfinger" (1964) from the James Bond movie franchise. AFI's 100 Years... 100 Heroes and Villains is a list of the one-hundred greatest screen characters (fifty each in the hero and villain categories) as chosen by the American Film Institute in June 2003. It is part of the AFI 100 Years… series. ​Click here for more about Heroes and Villains. ** -- "The Closer" TV series. Click on the top link for a listing of the 100 most sought-after character actors and actresses, based on the IMDb online database. Click here for a List of Actors/Actresses. 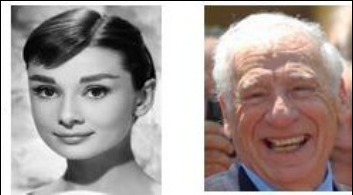 An actor (male) or actress (female) is a person who portrays a character in a performance. The actor performs "in the flesh" in the traditional medium of the theater, or in modern mediums such as film, radio, and television. The actor's interpretation of their role pertains to the role played, whether based on a real person or fictional character. Interpretation occurs even when the actor is "playing themselves", as in some forms of experimental performance art, or, more commonly; to act, is to create, a character in performance. Formerly, in some societies, only men could become actors, and women's roles were generally played by men or boys. When used for the stage, women occasionally played the roles of prepubescent boys. Twelve people and five media franchises have won all four major annual American entertainment awards in a competitive, individual (non-group) category: the Emmy, Grammy, Oscar, and Tony. Respectively, these awards honor outstanding achievements in television, audio recording, film, and theater. Winning all four awards has been referred to as winning the "grand slam" of American show business. The acronym EGOT was coined by actor Philip Michael Thomas. YouTube Video: Jane Fonda On Her Character's Most Important Scene In the Movie "On Golden Pond"
Barrymore Dynasty Lionel Barrymore (1878-1954), John Barrymore (1882-1942), and Drew Barrymore (1975). Show business, sometimes shortened to show biz or showbiz (since c. 1945), is a vernacular term for all aspects of the entertainment industry. From the business side (including managers, agents, producers, and distributors), the term applies to the creative element (including artists, performers, writers, musicians, and technicians) and was in common usage throughout the 20th century, although the first known use in print dates from 1850. At that time and for several decades, it typically included an initial the. By the latter part of the century, it had acquired a slightly arcane quality associated with the era of variety, but the term is still in active use. In modern entertainment industry, it is also associated with the fashion industry (creating trend and fashion) and acquiring intellectual property rights from the invested research in the entertainment business.